This article is 2732 days old. The 48 Hour Flick Fest is the ‘ultimate filmmaking challenge’, part of the Windsor International Film Festival, where groups of filmmakers are given only forty-eight hours to write, direct and score a short film that conforms to a number of plot themes outlined by the competition rules. Once learning the required elements for the film, including determining each team’s plot by a dice-roll, teams will take off from the Downtown Holiday Inn and commence filming. 48-hours later, the films must be submitted, and judging will begin! It’s quite an amazing competition, and something truly made in Windsor. 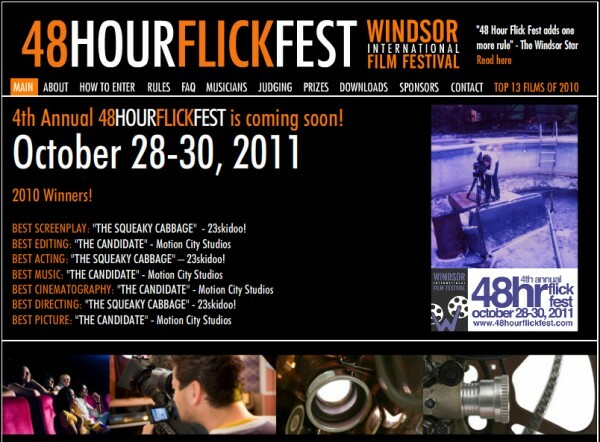 2011’s 48 Hour Flick Fest kicks off this Friday at 7pm in Downtown Windsor. For more information, visit the 48 Hour Flick Fest website.